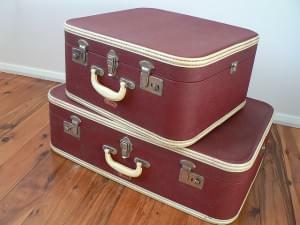 Vintage suitcases give you instant storage, and they slip perfectly under your bed. Living an uncluttered life means finding good storage spots in every room, so that seasonal or infrequently used items have a tidy home when not in use. Utilizing the empty space under your bed is a smart way to neatly organize and store stuff. Whether your bed is a twin or a California king, you have a lot of storage under the bed that’s free of charge! Here are 4 simple tips to maximizing under-the-bed storage and making the best use of each square foot of this prime storage space. Turn vintage or hard-shell suitcases into a functional and aesthetically pleasing set of storage containers in an afternoon. Shop your local thrift or antique store for hard-shell suitcases in good condition, and then wash and paint them as you wish. If you have extra storage space in the middle area under a larger size bed, use sturdy plastic containers and keep them out of sight by lining the edges with your fresh and new suitcase storage units. Before you start shopping for under the bed boxes, you need to know how high off the floor your bed is. Measure it so you know how much extra storage space you’re working with, and what sized containers will fit under the bed. Once you know how many inches off the floor your bed is, you’ll find dozens of storage options. Clear plastic tubs are a great place to store sweaters, giftware supplies, or holiday ornaments. Bed risers give you a lift and add height to your storage space. You can use any material that is durable and sturdy as long as all four risers are exactly matched in height. Concrete blocks, bricks, stable stacked wood pieces, or store-bought risers will all do the trick. In order to hide unsightly risers, buy or make a bed skirt that reaches all the way to the floor (added benefit of a bed skirt: more beautiful color and pattern to match your decorating scheme). Captain’s bed frames come in all sizes and include built-in drawers. For children and teens, two large drawers in a twin-size captain’s bed might be enough to eliminate the need for an additional dresser, thus freeing up floor space. If you don’t have a captain’s bed, a quick Internet search will yield dozens of options for rolling drawers that you can order online or pick up in a local store. You can even make your own rolling drawers by building wooden boxes and installing caster wheels on the bottom of storage boxes. Extra storage is always handy to have. If you need a safe storage place, Value Store It Self Storage is ready to help. Contact us today to find the best storage solutions.